Welcome to Katfrog's Corner: (E)Motions - A Video Game Playground!!! (E)Motions - A Video Game Playground!!! Last week, I took a risk and had a video game party to celebrate the end of the school year. 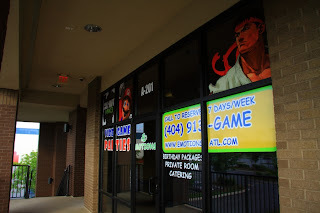 The risk was that I paid money to a unknown place called (E)Motions, located in Doraville, that supposedly provided a decent video game experience. Let's be honest, it's a bit of a drive from East Cobb. But since we have nothing here like that, I took a chance. Thank goodness I took that risk!! (E)Motions completely and utterly rocks!! My kids and their friends had a fantastic time there, playing various video games, eating pizza, and cheering each other on. Even the other Moms and I had a good time, sitting around and chatting. 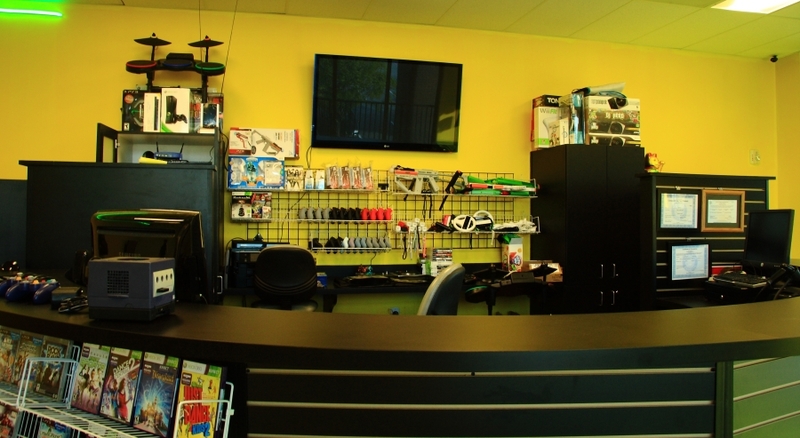 (E)Motions is located on the second floor of a brand new shopping center. As soon as we arrived, Armando greeted us and immediately went to work showing the kids around the store and getting everyone started on the game of their choice. The adults got a quick tour, including bathrooms clean up to eat from the floor. 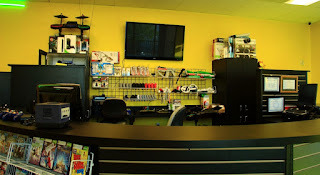 This place has it all, with over 200 video games to choose from on the Xbox, Xbox Kinect, Playstation 3, or Wii. I did not request any particular game, but they handle game requests if you or your kid desires a particular game. And for every console, not only does (E)Motion have regular game controller, but also the specialty game controllers that most people do not buy. I cannot say enough how much fun all of the kids had. Everyone wanted to go back there, and several kids are now planning birthday parties there. At $50 an hour to use the venue, a two-hour party only costs $100, which is a bargain these days. Now, if only they would open a store in East Cobb... But for now, I don't mind going to Doraville. It only took me about 25-30 minutes to get there. The storefront is located directly off I-285, easily located, so even that is not as much of a hassle as you might expect. Battle and Brew is a similar type of establishment, over on 120 loop south and Powers Ferry. Really every children get pleasure in the playground place for playground equipment.